A new lunar cycle begins on November 29 (in three days as I write this). To prepare for this new cycle of learning, intention, and awareness, I find it helpful to use astrology’s lens to see where I’ve been. It is helpful to look at the patterns of the past to prepare for current challenges. This way of looking at where I’ve been gives me a ground upon which to base my next choices. As events in the world push and pull us in many directions, it is helpful to remember this ground. It is my belief that this ground of being is not something I possess but something I develop and maintain relationship with. I feed this solid connection as I look at the stars and patterns of events. I feed this connection as I wonder what it means. This is my craft—the arrow I use to point to the truth. Your craft can be different. Your arrow unique to you, but the pointing is the same. Where is the ground, what is truth that sustains? Lunar intention shifts from Scorpio influence to Sagittarian influence. During the Scorpio lunar cycle we sensed behind the veils that separate the seen world from the unseen. Sinking down beneath the surface, we had the opportunity to listen to the ancestors, ask ourselves what really matters, and surrender our control over the cycles of life and death. Scorpio as a water sign offers this journey as a purification process, as preparation for the next season of Sagittarius. During this season, we take up our arrows just as the Centaur in Sagittarius’ constellation takes up the arrow to point at core truths. This is literally true as this constellation points towards the center of our galaxy. The ground of connection originates in Scorpio. We aim for aligning that experience with our choices. When intention shifts to Capricorn influences next month, we establish our goals and begin the climb to the mountaintop. Other patterns are active right now as well. The synodic cycle between Saturn and Uranus influences our next choices too. A synodic cycle is the cycle of relationship between two planets. A lunar cycle is a synodic cycle between the Sun and Moon. Outer planetary synodic cycles take a longer time and show patterns of history and events currently happening on the world stage. Right now, Saturn and Uranus are coming into the waning trine aspect. This follows the opposition between these planets that occurred in 2008 and 2009 (revolt of the Tea Party to Obama’s election). The cycle began in 1988. Whenever we think about the relationship between these planets we think about forces of conservation (Saturn) and forces of change and revolt (Uranus). These forces don’t take sides. As we look at history, we can’t see Saturn as the bad guys and Uranus as the good guys, or vice versa. These forces influence all of us. The tension happens internally. Historical moments are an expression of how they are influencing the whole. A trine is supposed to be a supportive aspect. This is when Saturn and Uranus are supposed to achieve an effective balance. History doesn’t seem to support this completely, however. It is something to wonder about. I sure am. In researching the Saturn/Uranus cycle I looked back to the last time they made this same waning trine with each other. It was in 1973, the same year of the occupation of Wounded Knee by the American Indian Movement, the same year Watergate was being investigated, the same year the U.S. withdrew from Vietnam. It was a big year. I am struck by the parallels between the encampments at Standing Rock and the events at Wounded Knee. Are we headed towards another presidential impeachment? How may history be repeating? How may we make different choices? The current trine aspect is exact December 24 and again in May and November of 2017. There is much more to come from these planets. It feels like a reckoning. As significant world events swirl around us, it is important to find a supportive ground of being with our roots deeply anchored in our recent Scorpio journey. The next steps to take are being guided by beliefs and values—a Sagittarian mission. Saturn is midway through its 2 ½ year transit of Sagittarius. The conserving forces of Saturn are honing Sagittarian ideals. This mutable fire sign loves freedom, the open horizon, the adventure of discovery. Saturn seems to be taking the wind out of the Sagittarian sails. It might feel like growing up. There are many recent examples of having to face the truth that has been there all along. I am mindful of the way people of color reacted to white shock that Trump could win. Waking up to reality may not feel good, but it is a powerful position to be in as we connect to a truer ground of being. Tuesday, November 28. The recent holiday weekend (in the U.S.) leaves us feeling like we need to recover from our supposed break. Today’s lack of aspects enhances this feeling. We are not quite back up to full speed. This is an appropriate time to reflect on the new lunar cycle beginning tomorrow. For this Sagittarian cycle, I am asking myself, What is my ground of being? What am I aiming for? November 29—New Moon: Dreaming. Sagittarius is a far-seeing sign. The sky has a message about this sign. This constellation is a centaur with an arrow pointing to the center of our galaxy. The Sagittarian paradox is that the center is the edge and the edge is the center. The search is on for meaning and illumination. The Sagittarian sees far and aims for the truth. As this New Moon seed is sown, it is time to reflect on the mission of using wisdom for truth’s cause. In post-modern worldview, it is considered wise to think of truth as relative. Here is another paradox—yes/and—truth is also a constant. The root of the truth comes from the word for “faithful.” Dogma isn’t truth, regardless of which side it is on. The truth is our ability to stand up for what we believe, to remain faithful to our guiding star. With Saturn midway through its 2 ½-year transit of Sagittarius, we are offered the opportunity to work hard to maintain our truth. Saturn asks us to work and Saturn gives the gift of authority when we do it. This lunar cycle isn’t for the weak of heart. Just as the arrow points to the center and the edge, we are asked to ponder all our paradoxes and work to maintain our ground of being through it all. 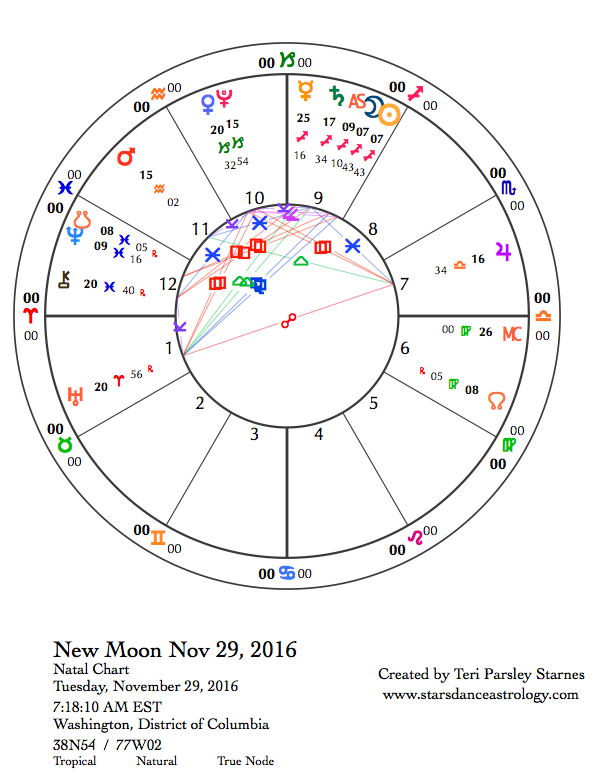 The Sun and Moon in the chart for the New Moon are square to Neptune and the South Node in Pisces. We are still shedding illusion as we seek our core truths. The North Node in Virgo says, develop discernment. It is hard to differentiate between the truth we want to believe in and the truth that anchors us to our ground of being. It may be hard, but it is not impossible. Every being has access to this ground. How do you know yours? Mindfulness practices are one tool to return to awareness and choice. Venus in Capricorn makes an exact square to Uranus in Aries on this day. A t-square involving Uranus, Jupiter in Libra, and Venus and Pluto in Capricorn flavors this entire lunar cycle with the seeds of seeking justice and balance as we confront authority and demand change. Venus attunes us to the importance of relationship and beauty. Love is an anchor and it can be hard to remember that if we feel the wobbly winds of change blowing us off our centers. Venus in Capricorn means business. We feel fierce in the face of disharmony. It is good to back up your passions with facts. Commitment is strengthened. Mars at the midpoint of Aquarius moves vision into action. Mars is in trine aspect to Jupiter. We are tempted to give free rein to ideas that support a new world. A waning trine between Saturn and Uranus (both in fire signs), asks us to build alliances between conservation and revolution. This doesn’t have to look like settling for injustice. Liberation and sustainability are possible. Under these influences I offer these questions for your New Moon work: Where is the ground? What is truth that sustains? Wednesday, November 30. Try this story on. Neptune has been conjoining the South Node of the Moon for a few weeks. For the South Node, think karma. For Neptune think illusion that separates us from the real healing medicine that Neptune can give us. This healing medicine is the experience of no divisions. Healing Neptune says there is no separation—not from the joy or the pain of the world. Mostly however, we twist this truth to support our illusions and refuse to accept the consequences of no separation. And so we continue to perpetuate more karma and more pain. The Sun in Sagittarius makes a square aspect to Neptune today. We may be forced to confront illusion. Projection of blame continues the cycle. What other choices can we make? We take this responsibility seriously as the Moon conjoins Saturn in Sagittarius and trines Uranus in Aries. Thursday, December 1. Yesterday’s transit between the Sun and Neptune softened us up. Today, Chiron—the Wounded Healer—stations direct and pierces our hearts. Chiron reminds that emotions are medicine. To care deeply is to be vulnerable. To embrace vulnerability is to live wholeheartedly. To live wholeheartedly is to be a healing force. Mars in Aquarius in a trine to Jupiter in Libra simply reinforces the idea that wholeheartedness is a force for good. These air signs encourage communication and intellectual connections. Resist distancing yourself from feelings and these ideas gain depth. Friday, December 2. On December 19, Mercury will station retrograde in Capricorn. Today Mercury enters Capricorn and the area of the zodiac it will retrograde through later. We get a foretaste of the tricks and lessons we are due to receive. Capricorn is an ambitious sign. Under this influence we work towards our highest goals. Life gets a little more serious. Success comes to those who show up with integrity. The Moon in Capricorn today simply reinforces that it is time we show up to support our ambitions. The Moon contacts planets in a t-square pattern, conjoining Pluto and squaring Uranus in Aries and Jupiter in Libra. Our appetite for justice, change, and transformation of corrupt systems is strong. from the ground of being. As I begin the work of this lunar cycle, I strive to embrace these qualities. The Aquarian themes of this phase of the Moon support a willingness to change and innovate. Mars in Aquarius forms an encouraging sextile to Saturn in Sagittarius. Sagittarian themes resound during this lunar cycle, which has been seeded by this mutable fire sign. Saturn gives structure to the quest for truth and meaning. Mars emboldens the quest. Truth comes from the word for faith. Belief is a wavering flame, much like a mutable fire. But when we anchor to the ground of our being, the flame is steady. This is tricky terrain, this ground of being. 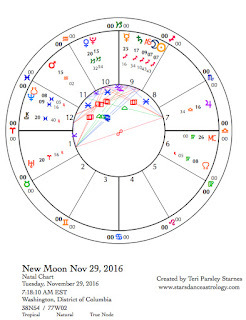 Neptune in Pisces conjoined with the South Node of the Moon invites us to release illusion, wishful thinking, and traps of dogmatism. There is a truth we can believe in. The steady flame can be fed. The work of this lunar cycle may be to temper faith through Saturn’s expectations of effectiveness. What works? I invoke a sense of curiosity at this time of the crescent Moon. Sunday, December 4. Expect a sparkly day. By this, I mean breezes of hope and glimmers of possibility infuse our sense of purpose. The Moon is waxing in Aquarius and it is time to engage, act, and create. Aquarius and Sagittarius (the Sun’s sign and the seed of this lunar cycle) have affinity. Together they push us farther into potentialities. The Moon makes favorable contacts with Jupiter in Libra (another air sign) and Saturn in Sagittarius. Obstacles are suddenly gone and all we had to do was shift perspective. Notice how this happens for you. It is a tool for heavier times. Monday, December 5. Keep riding the wave of positive action today. For most of the day, the Moon isn’t making any aspects and this could bring on a feeling of deflation. Don’t be discouraged. Take breaks. Rest. Assess recent events. Listen. Learn. Tuesday, December 6 The Moon in Pisces sometimes signals a time to retreat and restore. Not so much this time. The Moon is waxing and the sextile aspect between Mars in Aquarius and Uranus in Aries is helping us amp up rather than kick back. The Pisces influence reminds us of why we care, why we are willing to make sacrifices for the bigger cause. Idealism is high. That does not guarantee that everyone will agree with yours. Practice finding your ground of being. The Moon contacts Mercury in Capricorn and Neptune in Pisces. We appreciate strategic thinking but don’t try to be too detail-oriented. Intuition guides the day. December 7—First Quarter Moon: Manifesting. If truth is related to faith, then a test of faith may come at this phase of the Moon. The Sagittarius lunar cycle was seeded with dreams of truth and hopes for change. There’s probably a good reason that some dreams and truths don’t survive for very long. Perhaps we need the testing to find the solid ground of being that lets our dreams and truths have their own lives. The Moon in Pisces interjects doubts as well as fanaticism. Pisces is the mutable water sign. It is fluid and has a purpose beyond logic. Sagittarius, the mutable fire sign, uses passion the same way Pisces uses compassion—to connect with spirit. Our passions and compassions are coming to a head. Now would be a perfect time to remember the solid ground of being that helps us aim for the truth. The Moon also squares Saturn in Sagittarius, which is only 2 degrees away from the Sun. What test has Saturn given you during his transit of this sign? Perhaps you lost faith. Perhaps you’ve found it and now must work hard to serve it. Perhaps you struggle with communication—how to best share your truth? Perhaps you are midway through an educational commitment. Perhaps you are ready to graduate. Whatever the work, notice what helps you to keep trying. Venus enters Aquarius. We become interested in a diverse assortment of people and ideas. Fresh perspective comes from free thinkers. Thursday, December 8. Enough with the Pisces introspection of the last couple of days. You might miss it. The Moon enters cardinal fire sign Aries today and suddenly inhibitions are much more lax. Notice where your impetuosity leads you. Sometimes this is just what we need to get moving again. However, there’s a downside when we lose connection to our ground of being. This lunar cycle, I am exploring my ground of being. As an Aries Sun sign myself, I suspect when I am strongly anchored here, my impetuous leaps will have less destructive impact. The major problem with the day may come from miscommunication. The Moon makes a square to Mercury in Capricorn. You might run into issues with those who have a more literal mode of expression. Friday, December 9. It feels like the week has been building to this turning point. The Moon in Aries falls into a t-square aspect pattern that has been in place since the New Moon on November 29. This pattern keeps the pressure on. Pluto in Capricorn is square to the opposition of Jupiter in Libra and Uranus in Aries. These are the elements of a struggle between oppressive forces, revolutionary forces, and balancing forces. Jupiter’s mission is to find the harmony, the way through impossible impasses. The message is clear, change needs to happen, the stakes are high, and many are responding with a strong desire to fight. With the Sun in sextile aspect to Jupiter, the fight can be peaceful, but it will still rock the boat. December 10—Gibbous Moon: Perfecting. You might be wondering how you can be more determined, more willing to stand up for your truth, more committed to the practice of knowing your ground of being. Well, you can. Saturn is asking you to try a little harder as the Sun and Saturn make their once-a-year conjunction. Under this phase of the Moon, we sense we are on the cusp of a breakthrough. The Moon is pregnant with possibilities craving to be released at the Full Moon on December 13. To see the fruition of this lunar cycle, we need to keep focused on what we desire from it. Mercury in Capricorn makes a sextile aspect to Neptune in Pisces today. This transit opens the portals to effective intuition. Trust your instincts. Purify your intentions. The Moon in Taurus reminds us that wisdom comes from our bodies in connection to the Earth. Good progress happens when we center ourselves in that reality. Sunday, December 11. The trine between Saturn in Sagittarius and Uranus in Aries gets an extra kick in the pants with the Sun joining in on the transit. Yesterday, the Sun conjoined Saturn. Today, the Sun trines Uranus. In the introduction to this lunar cycle I wrote about the synodic cycle between Saturn and Uranus. This is a lengthy cycle, which began in 1988 and will conclude in 2032. These planets represent two strong influences. In very simple terms, Saturn represents conserving forces and Uranus represents liberating forces. Even in a harmonic aspect like a trine (both planets are in fire signs right now), we feel the tension creating a need to respond and evolve. Under Uranus influence, the call is to wake up and act. Under Saturn influence, the pressure is to use our beliefs to protect and defend what we sense is in danger of dying. The work of this lunar cycle is not insignificant since it touches upon Saturn’s fear and determination in the sign of Sagittarius. The momentum is carrying us in ways we cannot control. It is good to remember the ground of being that helps us have faith that we are doing enough. We are enough.